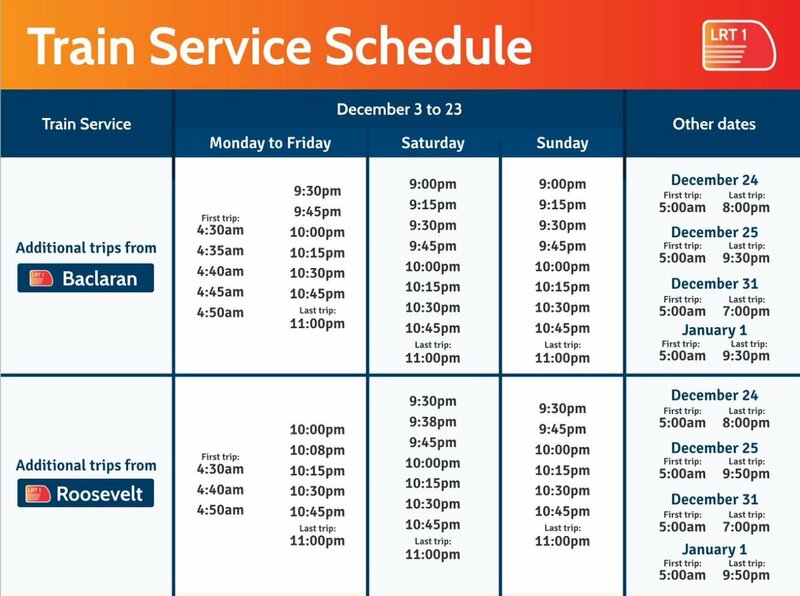 MANILA, Philippines - The Light Rail Transit (LRT), Metro Rail Transit (MRT) and the Philippine National Railways (PNR) management have released adjusted train service schedule for December 24, 25, 31, 2016 (Christmas Holidays) and Jan 1, 2017 (New Year) operations. 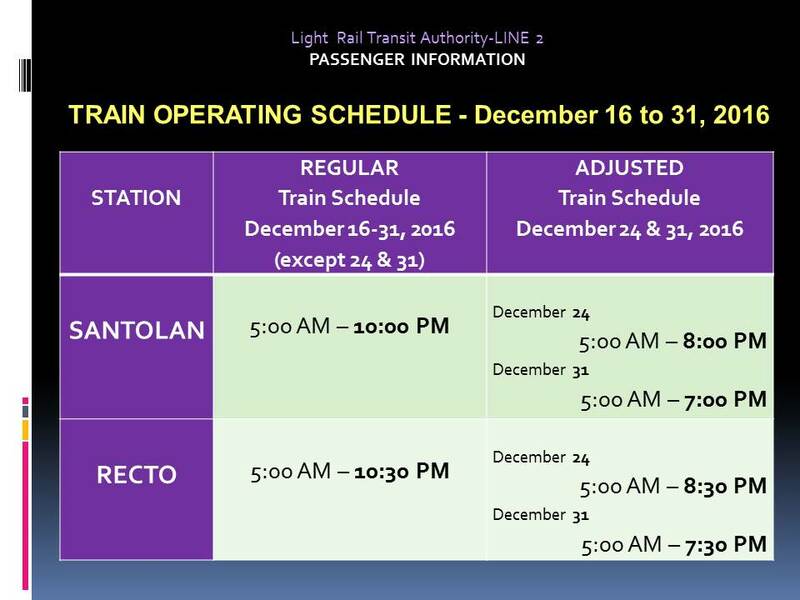 The Light Rail Manila Corporation (LRMC) has added more late night trips from December 3 to 23, with the operating hours of LRT1 extended until 11 p.m. daily. First trip to start at 4:30 a.m. (Monday to Friday). On December 24, 25, 31 and January 1, train operation will start at 5:00 in the morning, with last trip at 8:00 p.m., 9:30 p.m., 7:00 p.m. and 9:30 p.m., respectively (Baclaran station) and at 8:00 p.m., 9:50 p.m., 7:00 p.m. and 9:50 p.m., respectively (Roosevelt station). LRT 1 Christmas Holiday Schedule 2016. For LRT2, which links Recto in Manila to Santolan in Quezon City, regular revenue operating time from December 16 to 31 is 5:00 a.m. to 10:00 p.m. (Santolan) and 5:00 a.m. to 10:30 p.m. (Recto). The last train on December 24 leaves Santolan at 8:00 p.m. while the Recto train leaves at 8:30 p.m. On December 31, the last trip from Santolan station is 7:00 p.m. and the last train from Recto leaves at 7:30 p.m.
LRT 2 Christmas Holiday Schedule 2016. MRT3 starts its operations from 4:30 in the morning. The last southbound trip leaves North Avenue in Quezon City at 10 pm, and the last northbound trip leaves Taft Avenue at 10:30 pm. 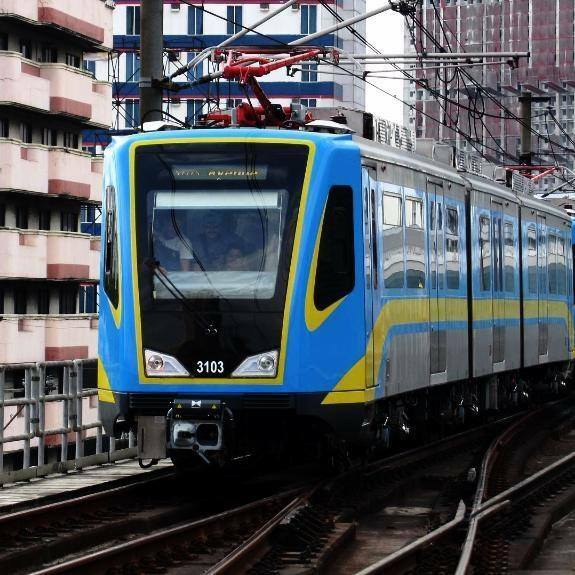 The state-run Philippine National Railways (PNR) operates on regular train schedule for the Metro South Commuter Line (MSCL), which runs from Tutuban in Manila to either Alabang in Muntinlupa City or Mamatid in Laguna. Tutuban to Alabang bound to start at 5:05 a.m. with last trip at 7:35 p.m. daily. For the northbound, train operations run from 5:34 a.m. until the last trip at 7:34 p.m. daily. For the Tutuban to Mamatid trip (once per day), train departs at 7:05 p.m. and arrives at 9:42 p.m. For northbound, departure time is at 4:42 am and arrival time at 7:20 am. The Inter-Agency Council on Traffic (I-ACT) through the Metropolitan Manila Development Authority (MMDA) has announced the suspension of number coding scheme for all private vehicles on December 26, special non-working holiday; December 29; December 30, Rizal Day; and January 2, also a special non-working holiday.